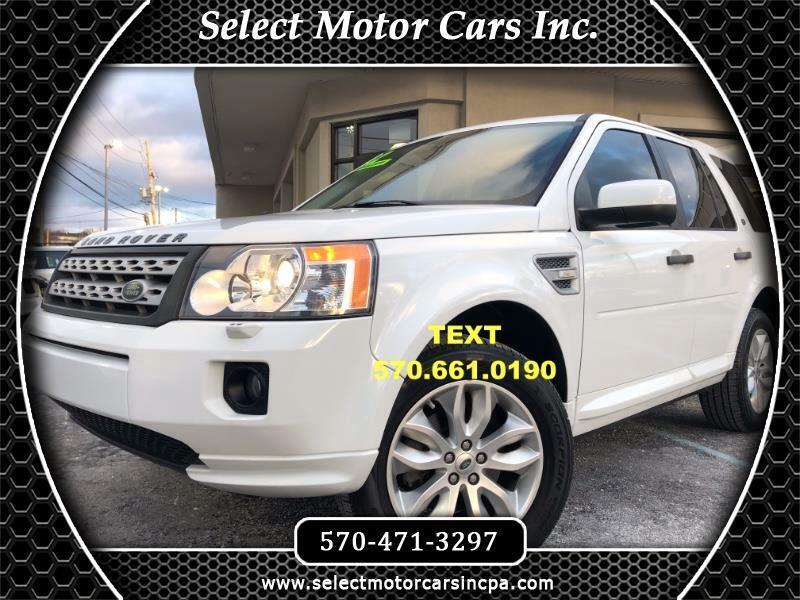 Used 2012 Land Rover LR2 HSE for Sale in Moosic PA 18507 Select Motor Cars Inc. Right out of Florida hard to find 2012 Land Rover LR2 HSE AWD Luxury in gorgeous Fuji White exterior with Black interior. Features include 3.2L V6 engine, automatic transmission,All Wheel Drive,18" wheels, fog lamps, dual power heated mirrors, keyless entry, rear spoiler, privacy tint, park distance control, headlamp washers, premium leather interior, dual power seats, wood trim, cruise control, steering wheel controls, tilt steering wheel, auto headlamps, auto dimming mirrors, front heated seats, traction control, dual zone climate control,Alpine audio system,6 cd changer,sirius satellite radio, bluetooth connectivity,Navigation system, auxiliary input, 12 outlet,backup camera capability, wifi ability, traffic capability, text notifications, trip advisor apps, foursquare app, center console, cupholders,amongst many other great features.